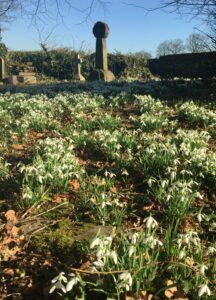 The last of the three fenced tombs to be built in the old churchyard at Ayot St Peter is also the smallest and plainest. Its simple table-top design marks the graves of three members of the Prodgers family, and it is sited in the north-west corner of the churchyard. It is aligned to the east-west axis and to the Peacock tomb in the north-east corner. A quartet of yew trees is planted nearby, and the closest of these somewhat overshadows the tomb. It is unclear whether these trees were planted when the tomb was built or were already growing there at the time. As with the histories of the Forsyth and Peacock tombs, I have been very ably assisted by fellow-researchers Valerie Richards and Robyn Jacobs. In 1841 Rev Edwin Prodgers became rector of Ayot St Peter, following the brief tenures of Rev James Prince Lee and Rev Philip Yorke Savile. He would remain in office for 21 years and then be succeeded by his son, another Rev Edwin Prodgers. 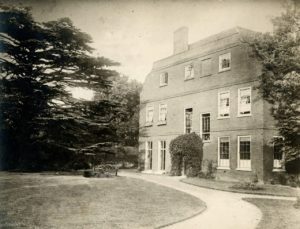 Father and son lived in what was then the rectory, the rather grand Ayot Bury. Their tenure is remarkable mainly for the fact that they arranged for the replacement of the 18th century octagonal church and its separate campanile by the Victorian church designed by John Loughborough Pearson (1817-97), which was largely destroyed by fire in 1874. Edwin junior also got Pearson to design a new rectory, which was built in 1866-67. Edwin senior was a student at Trinity College, Oxford, and it is recorded in Alumni Oxonienses that his father was Edward of Worcester ‘arm.’ This is the abbreviation for armiger, which signifies the right to bear heraldic arms. The Prodgers claimed to be of an ancient Monmouthshire lineage which had removed itself to the Ludlow area of Shropshire. Edward Prodgers (1738-1819) made his living as a butcher in the parish of St Swithin in the city of Worcester. He learnt the skills of the trade as an apprentice to Worcester butcher Giles Blower under indentures signed on 15 June 1753. On 3 October 1770 he married his former master’s daughter Mary Blower at St Swithin’s. There were five children – Giles (b 1772), Edward (b 1773), James (b 1775), Elizabeth (b 1782) and Edwin (b. 1786). Initially, the three brothers Giles, Edward and James were in business together as druggists at Ludlow. There is a record of Giles and James engaging George Jeynes as their apprentice in this trade on 28 March 1803. 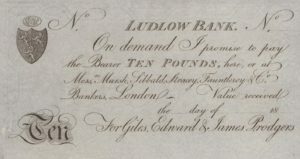 They progressed to become the proprietors of a small bank called the Ludlow Bank, and they were listed as bankers at Ludlow in Pigot’s Directory for 1822. As was the case with many local banks in the decade following the end of the Napoleonic War, it failed and no doubt caused considerable distress, if not ruin, among its customers. The failure occurred in October 1824, and in the London Gazette no. 18096 (4 January 1825) is to be found a notice directing the three brothers to attend meetings of their creditors at the Angel Inn, Ludlow, in January and February 1825. In December of that year the bankruptcy commissioners paid a dividend of 6s. [30 pence] in the pound on debts totalling £161,681. 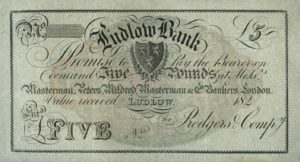 Notes of the Ludlow Bank (issued and unissued) are bought and sold by collectors of banking ephemera to this day. When Edwin’s brother Edward died in 1865 his estate was sworn at under £100. Elizabeth, the only daughter of the family (and the sister of Edwin) married Richard Harper at Ludlow on 6 July 1803. They had four children – Mary (b 1804), Anne (b 1805), Richard (b 1806) and Elizabeth (b 1809). Mary and Anne Harper will have a role to play in this story as it unfolds. After graduating from Oxford Edwin took holy orders and, in 1824, was appointed as the first vicar of St Matthew Brixton. 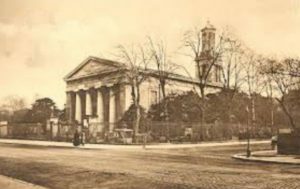 The foundation stone for this large church built in the Greek revival style was laid in 1822 by the Archbishop of Canterbury and it was consecrated two years later by the Bishop of Winchester. In 1828 in his own church Edwin married Caroline Blades (b 1792). Caroline Prodgers (née Blades) was the second daughter of John Blades (1751-1829) and his wife Hannah Hobson (1766-96), who were married at St Bride Fleet Street in 1789. Their eldest daughter was called Elizabeth (b 1790), and there was a younger daughter Laura (b 1794) and a son John Hobson Blades (b 1796). John Blades was the oldest surviving of seven sons of James Blades (1726-93) and his wife Elizabeth Hall (1724-91). James made his living as a shoemaker (or cordwainer) based in the hamlet of Stainton in County Durham. His marriage and the baptisms of his children took place in the parish church of St Mary at nearby Barnard Castle. 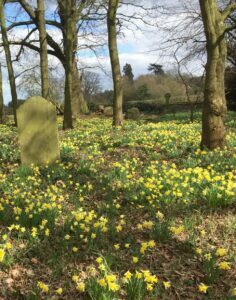 The sons were Parkin (1749-63), John (b 1751), William (b 1755), Robert (b 1758), James (b 1761), Emanuel (1765-91) and Parkin (b 1769). There are two headstones at St Mary Barnard Castle, one for Elizabeth Blades (d 1791 aged 67) and her brother Emanuel Hall (d 1768 aged 35) and another for her husband James Blades (d 1793 aged 67).and their son Emanuel Blades (d 1791 aged 26). It is recorded in Bulmer’s History and Directory of North Yorkshire (1890) that the lineage of John Blades could be traced to Lunds in High Abbotside, on the boundary between the North Riding and the old county of Westmorland. There is no reason to doubt this history but there is no way of proving its truth today. However, it is interesting that a century later in the 1861 census there was a farmer of 112 acres at High Abbotside called James Blades who was born there and had sons called John, James and Parkin. This unusual first name was much used in the Blades family. 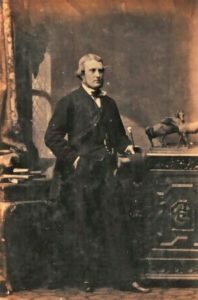 John and Elizabeth Blades called their first son Parkin and, following his untimely death, they gave the same name to their last son. The name is mostly rendered as Perkin in the records but it seems as if it should always have been Parkin. It could be that the name reveals support for the Yorkist claim represented by Perkin Warbeck – particularly as, when he was duke of Gloucester and lord of the manor of Barnard Castle, Richard III paid for improvements to the parish church where John and Elizabeth were married and their children baptised. Alternatively, it could be the maiden name of a Blades wife, passed down the generations. In particular, a marriage at Ravenstonedale in Westmoreland in 1670 could be John Blades’ great grandparents. The wife was Margaret Parkin. The register states that the husband, John Blades, was from Lunds in Aisgarth, which ties in with Bulmer’s History and Directory of North Yorkshire mentioned above. The 1890 history records that as a young man John Blades set off for London to make his fortune with the proverbial half-crown in his pocket and obtained employment in a glass seller’s shop on Ludgate Hill. 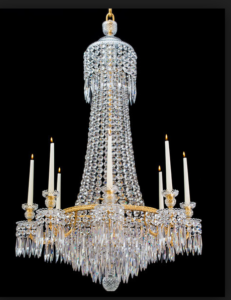 What we can be quite sure about is that he succeeded mightily in the field of glassware in London and became the holder of a royal warrant. His fortune when he died in 1829 was officially put at some £140,000 (the equivalent of many tens of millions of pounds today). Three of his brothers followed him to Ludgate Hill and died in London – Robert (d 1824), James (d 1788) and Perkin junior (d 1793). John Blades was master of the Worshipful Company of Glass Sellers of London for three terms – 1789-90, 1808-09 and 1824-25. His brother Robert was master in 1815-16. 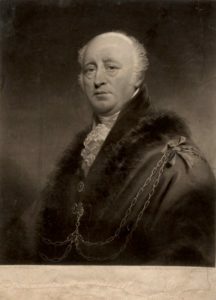 The National Portrait Gallery has a mezzotint of John Blades in the robes of sheriff of London and Middlesex, an office which he held in 1812-13. Like the mezzotint of Thomas Forsyth, this one was after a portrait by Sir William Beechey (1753-1839). The original oil painting was made in 1815 at a cost of £52 10s., paid in two equal instalments of £26 5s. John Blades’ wife Hannah Hobson was one of the nine children of well-known south London builder Joshua Hobson (1728-82) and his wife Martha Holmes (1726-70). Both families were Quakers. 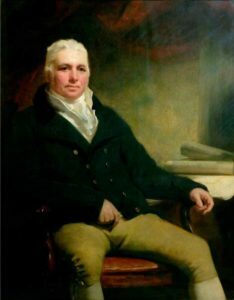 Hannah’s brother William Hobson (1752-1840) became an enormously successful building contractor. He was famous for building the Martello Towers, among many other edifices. He and his wife Ann Rickman (1758-1831) had 16 children. They lived in great style in Markfield House, the home which he built for them at Stamford Hill, Tottenham, in 1798. In about 1811 they engaged the illustrious Scottish artist Sir Henry Raeburn (1756-1823) to paint their portraits, which are now in the collection of the Victoria & Albert Museum. John Constable also visited Markfield for two weeks in the summer of 1806, when he made sketches of his host and hostess and some of their children. 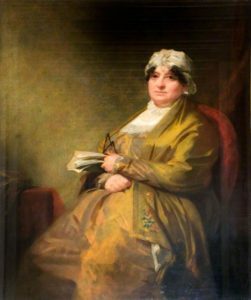 Hannah’s sister Lydia (1754-1827) married another major building contractor, William Blackburn (1750-90), who was famous as the builder of penitentiaries. Later, Hannah’s eldest daughter Elizabeth (1790-1878) married her first cousin Joshua Blackburn (1790-1840), son of William and Lydia. John and Hannah Blades had only had four children when Hannah died in 1796 aged 30, shortly after the birth of their only son. 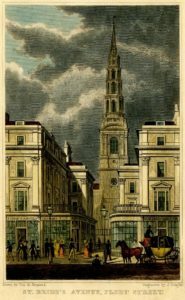 The children were all born at 5 Ludgate Hill and baptised at St Bride Fleet Street (in one batch on 19 January 1801) and are believed to have been the only grandchildren of James and Elizabeth Blades of Stainton. John was 45 when Hannah died and he never remarried. He must have made arrangements for his young family to be cared for in the absence of their mother. He devoted himself to the business and to building up an extensive property empire. From perhaps as early as 1790 he had held the tenancy of the old Brockwell Hall (which stood close to the present Norwood Road) in the parish of Brixton. 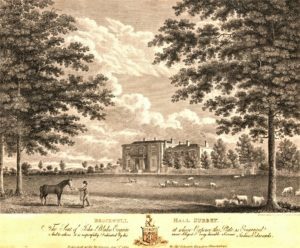 By 1811 he had purchased the old hall and, in a piecemeal fashion, the neighbouring land totalling some 60 acres and, in 1811-13, built the new Brockwell Hall on the highest point and demolished the old hall. In 1825-26 (at a cost of £5,000) he built another ‘capital messuage’ which was originally known as Brockwell Lodge but came to be called Clarence Lodge and stood a little way off to the north-west of the new hall; it was demolished in 1908 and its site is now occupied by the BMX track in the modern Brockwell Park. He also owned the freeholds of the extraordinary Severndroog Castle at the top of Shooter’s Hill, a farm in Essex and two others in Kent, a vault under the vestry at St Bride’s, his business premises at 5 Ludgate Hill (which was at the west end of the south side of that street), a shop in Ludgate Street let to a haberdasher called Eyles (confusingly numbered 23 Ludgate Hill) and a considerable number of other holdings, including leasehold ground behind 5 and 23 Ludgate Hill and all the other properties between them. St Bride Fleet Street was the parish church for 5 Ludgate Hill, and John Blades was clearly attached to it. 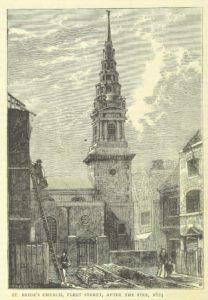 On 14 November 1824 a fire destroyed some houses on the south side of Fleet Street which, until then, had shrouded the church for more than 120 years. The opportunity was taken to open up a view of the church by constructing St Bride’s Avenue. John Blades was the chief promoter of this project; a fund was raised to buy out the former householders and, when it failed to reach the required total, he stepped in with a magnificent donation of £6,000 (approaching £500,000 today). The first stone was laid on 3 November 1825 by John Blades, assisted by the architect, in a mass of masonry about the centre of the west side of the avenue. A time capsule containing pieces of the latest coin of the realm was buried and a brass explanatory plate was installed. The benefits of John’s vision and generosity have been enjoyed by visitors to Fleet Street for nearly 200 years. In his will John refers to his one freehold and three leasehold messuages in Fleet Street, which are no doubt those which were built in 1825-26 on either side of the avenue. 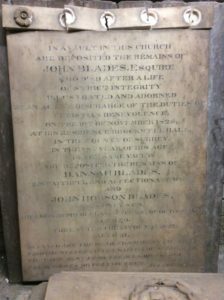 John Blades was buried in his vault at St Bride’s. By 1829 it already held the remains of his three brothers, his wife and their only son, John Hobson Blades (d 1827). Two memorial plaques commemorating the six lives were to be seen on the walls of the tower until the church was gutted by incendiary bombs on the night of 29 December 1940. The plaque for John, Hannah and their son survived and is now on display in the crypt of the rebuilt church but that for John’s three brothers is no longer visible. Luckily, all the inscriptions were recorded in the years prior to the bombing and can be seen on the British History Online website under the heading “The architecture of St Bride’s: Monuments”. John Blades left a very long and complicated will dated 17 February 1829, together with a number of codicils. His executors were his nephew Joshua Hobson of Stamford Hill and his friend Robert Currey of Herne Hill, who together obtained a grant of probate on 4 December 1829. Robert Currey was a tobacco merchant with a wholesale business at 8 Shoemaker Row (off Ludgate Street) and a retail shop at 106 Fleet Street. His wife was Charlotte Lipscomb and one of their sons was called John Blades Currey (b 1829). Charlotte’s brother was solicitor Henry Lipscomb, who lived at Staindrop, Co Durham, showing that there were family links back to John Blades’ place of birth a couple of miles away at Stainton. Henry Lipscomb’s son was the vicar of Staindrop. Robert Currey, who also had a son who was a clergyman, died in 1849. His wife and only son having predeceased him, John Blades’ estate (after a number of bequests to servants and various charitable institutions) fell to be divided among his three daughters. The youngest, Laura, was ‘of unsound mind’ and in his will her father made arrangements for her to be accommodated and looked after for life in a substantial property at Streatham Green called Russell House (which stood across the road from the parish church of St Leonard on a site now occupied by the Roman Catholic church of the English Martyrs). In the 1841 and 1851 censuses she can be found living at Russell House with Mary and Anne Harper. As we have seen, these were unmarried daughters of Rev Edwin Prodgers senior’s sister Elizabeth and her husband Richard Harper. Although the page for Russell House is missing from the surviving record of the 1861 census, it is almost certain that similar arrangements prevailed at that time and until her death there on 28 November 1870. Her estate amounted to £35,000 and her executor was Rev Edwin Prodgers junior. The balance of John Blades’ estate was divided between his other two daughters, Elizabeth Blackburn and Caroline Prodgers. Elizabeth Blades and Joshua Blackburn were married in January 1822. Despite the fact that Elizabeth was living with her father at Brockwell Hall the wedding had to be held at St Mary Lambeth, because the nearby church of St Matthew Brixton did not exist – its foundation stone was not laid until later in the year. By the time her father died in 1829 Elizabeth had had five children at Brockwell Hall. Under John Blades’ will Elizabeth and Joshua had the right to occupy the hall and 24 acres of the park for life. They had two more children in 1830 and 1832 but then Joshua died there on 8 June 1840 at the age of 49. In his long will made on 2 May 1840 (of which his widow was the executrix) he described himself as a partner in a brewery in Liquorpond Street. This was Reid’s Brewery and the street name is now Clerkenwell Road. Reid’s eventually became part of Watney, Combe, Reid & Co. Limited. Elizabeth moved out of the hall following her husband’s death and spent the rest of her life north of the Thames in the old county of Middlesex. She died in 1860 aged 59 leaving an estate of £4,000 in the care of her son Joshua Blackburn junior as executor; he inherited the Brockwell Park estate. He had married Mary Ann Smiles (1822-82) in 1853 and with her had five children, all of them born in Middlesex. He did not move back to Brockwell Hall but instead built a new home for his family called Brockwell House, close to the site of the current Brockwell Park lido. He was a barrister who never practised and, indeed, ended up in a mental institution with his affairs managed by trustees. 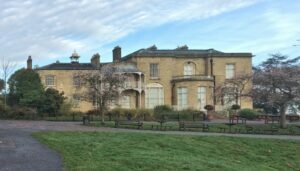 Following his death in 1888 his elder son, Joshua John Blades Blackburn (1854-98), sold his estate at Brockwell to the London County Council. Joshua Blackburn’s estate amounted to just under £37,500; his executor was his widow’s brother Dr William Smiles. Joshua John Blades Blackburn left an estate of just under £18,000 when he died in 1898. How it was that Rev Edwin Prodgers senior was appointed as the first vicar of St Matthew Brixton in 1824 is unknown. The new church was and is a short walk to the north of Brockwell Park and it will surely not have taken Edwin long before he made his first visit to the Blades family in the hall. There is a story that Edwin rescued Caroline Blades from drowning and then went on to marry her. The park includes ornamental lakes where the incident could have occurred, but nothing is known about the circumstances or the locus. Following their marriage in 1828 Edwin and Caroline set up home in Clarence Lodge. When John Blades died in the following year the couple secured the right, under his will, to occupy the property and 10 acres of the park for life. They had four children there between 1829 and 1835 – Caroline (b 1829), Emily (b 1831), Edwin (b 1833) and Herbert (b 1835). In 1841 Edwin gave up the living at St Matthew’s and took up that at Ayot St Peter. He was instituted and inducted into his new parish on 11 March 1842. 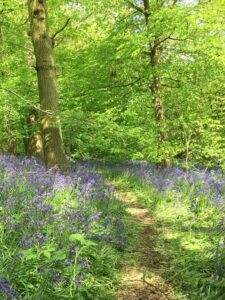 Quite what motivated the move away from the prestigious post at Brixton and the comforts of Clarence Lodge to the quiet and remote living at Ayot is a minor mystery, but it may have had something to do with his wife’s or eldest daughter’s state of mind. 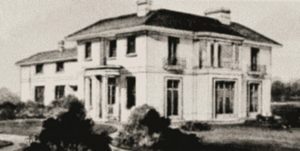 Alternatively it may simply have been connected with the fact that Elizabeth Blackburn and her children were leaving Brockwell Hall at this time. Certainly the move to Ayot Bury enabled Edwin to indulge his interest in field sports to the full. The lifetime occupancy rights of the Blackburns and Prodgers gave rise to a case reported as Hobson v Blackburn in 1 Mylne & Keene pp571-581, which was decided by the Master of the Rolls on 10 June 1833. (In the report the Prodgers are called Rodgers). He held that it was for the grantee (here the Prodgers) to specify exactly the boundaries of their 10 acres; it did not matter that the Blackburns would have preferred them to fix on different boundaries. The case also dealt with the leasehold ground behind 5 and 23 Ludgate Hill and decided that, to the extent that it was physically connected to the two freeholds, it should pass with the freeholds and not be segregated from them for inheritance purposes. The Arms of Prodgers quartering Blades, to commemorate the marriage of Edwin Prodgers and Caroline Blades. Quarters one and four represent the Prodgers family and quarters two and three represent the Blades family. The motto is from the Prodgers family “Devouement sans bornes” (Devotion without limits). This illustration is from from Armorial Families by Arthur Charles Fox-Davies, Edinburgh 1899 (3rd Edition). The artist is not known. At the time of the 1841 census Rev Edwin and Mrs Caroline Prodgers were still at Clarence Lodge whilst at Ayot St Peter the rectory (Ayot Bury) was occupied by the 55-year old earl of Mexborough and his 25-year old third son, Rev Philip Yorke Savile, the rector. 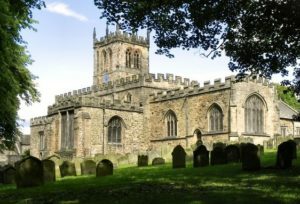 The earl’s estate was at Methley in Yorkshire, and in 1841 the earl was able to present his third son to the living of Methley parish church. He retained the advowson at Ayot and must have made arrangements with Edwin Prodgers to take up the living here upon his son’s departure. The earl’s widow sold the advowson to Edwin in 1853. Any payments from the Prodgers to the Saviles will no doubt have been financed out of Caroline’s large inheritance. On 19 March 1850 the rector’s second daughter, Emily, died at the age of 19. This must have been a terrible blow for her parents and siblings. Her father’s curate, Rev John Johnson Tuck, conducted the funeral service in the octagonal church, and the burial in the old churchyard, on 26 March. 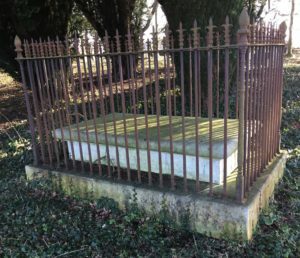 The fenced family tomb was presumably designed and installed between this death and that of Edwin himself. On census night in 1851 (30 March) Ayot Bury was occupied by the rector, his wife and their children Caroline (21) and Herbert (15), together with a schoolmistress and four domestic servants. In 1861 the census taken on 7 April listed the occupants as the rector, his wife, their son Edwin (27), who was by now the curate, and three domestic servants. Caroline was living independently in a lodging house at 12 Upper Berkeley Street, Marylebone. Herbert was recently married and on census night he and his wife happened to be staying at the Great Western Hotel at Paddington. Rev Edwin Prodgers senior died aged 75 on 5 December 1861, not at Ayot Bury but at 12 Upper Berkeley Street. Presumably he fell ill and died when visiting Caroline at her abode. His coffin was brought back for burial in the family tomb in the old churchyard. The funeral service and burial on 13 December were conducted by Rev William Adams, rector of Throcking, Hertfordshire, who was no doubt a friend of the family. Edwin left an estate valued at £80,000. His widow was his executrix. Evidently Edwin Prodgers senior came to consider Freman’s church unsuitable and started to make plans for its replacement. Progress was clearly very slow because when he died in December 1861 the octagonal church still stood. His was the last funeral held in the old church. When his son took over as rector, he immediately put their joint plans into execution. In 1862 the old church and its bell tower were demolished and the Pearson church was built and consecrated. Much of the expense was borne by Edwin junior out of his own pocket; in other words, it was effectively paid for by his late grandfather John Blades. Among the first funerals conducted in the new church was that of the new rector’s mother. Caroline Prodgers died at Ayot Bury on 4 March 1863 at the age of 70. Her funeral and burial took place on 13 March. Again, Rev William Adams officiated. Caroline’s burial was the third and last in the family tomb. Her estate amounted to £18,000, of which her son Edwin was executor. Emily the beloved child of the Rev.Edwin and Caroline Prodgers who departed this life in the 18th year of her age 19th March 1850. Also the Reverend Edwin Prodgers who died December 5th 1861 Et 75, 20 years Rector of this Parish and Caroline his dear wife who survived him fifteen months and died March 4th 1863 Et 70. It is evident that the inscription includes an error. Emily was baptised by her father at St Matthew Brixton on 8 May 1831 and would have been 20 in early 1851. She was therefore aged 19 (or in the 20th year of her age) when she died. The eldest daughter, Caroline, was born in 1829 at Clarence Lodge. She moved to Ayot Bury with her parents in 1841 and was still living with them 10 years later. By 1853 she was exhibiting signs of the mental illness which was to affect her for the rest of her life. On 11 August she was admitted to a private asylum called Wood End House at Hayes in Middlesex, where she remained until 2 November 1854. On discharge it was recorded that her condition had ‘not improved.’ Nevertheless, she went on to become a wife and mother. Her husband was a citizen of the Empire of Austria serving as an officer in the Italian navy called Giovanni Battista Giacometti, who was some six years younger than her. Caroline was living at 12 Upper Berkeley Street in 1861 and accordingly it is no surprise that her wedding on 15 February 1862 was at St Marylebone parish church. Caroline’s mother entered into a substantial marriage settlement for the benefit of her daughter and son-in-law. There were two sons – Ferdinando (b 1862) and Ernesto Umberto (b 1864). Both boys were baptised at Ayot St Peter by their uncle Edwin Prodgers. The marriage began to fall apart in the late 1860s. In November 1870 the husband obtained a court order for the restitution of his conjugal rights but it was not obeyed and ultimately in November 1873 he was granted a decree nisi for divorce on the ground of his wife’s adultery. The evidence for this was the birth of a daughter Eleonora Philippa Emily of whom her husband was not the father. When the daughter was born in 1872 Caroline was living at Beauclerc Lodge, Balham, but by 1875 she had moved to St John’s Wood, where she lived until she died aged 61 in 1890. She made a will on 29 July 1882 under which her beneficiaries were her two sons and her daughter. Her estate amounted to a little over £9,000. She appointed William Wright, the farmer at Ayot Place (now Ayot Montfichet), and her two sons as her executors but the grant of probate was obtained by William Wright alone. Caroline Giacometti Prodgers became a figure of fun in the press. The divorce proceedings, wrangles over money and her habit of haranguing taxi drivers filled many column inches. She could be described as a vexatious litigant. Under the will of her aunt Laura Blades Caroline received a substantial legacy. She went to court in an attempt to deny her husband any share in the legacy. She failed at first instance and again on appeal, where the judges expressed their strong disapproval of her cause and ordered her to pay all her husband’s costs. It might be supposed that her husband was at least partly to blame for her trials and tribulations but in fact her brother, Edwin junior, gave evidence that Giacometti was very long suffering and did his utmost to save his marriage and provide a stable home and education for his sons. The records show, nevertheless, that he could be somewhat economical with the truth. Furthermore, her long campaign against being overcharged for taxi journeys did eventually bear fruit to the benefit of the general public. In 1876 Giovanni Giacometti successfully applied for British citizenship by naturalisation. In his application he gave his address as 5 Bina Gardens, South Kensington, and stated that his two sons were living with him and that he was a widower. From this point on their record in the name of Giacometti is completely silent, but searches of census records using only given names and birth dates and locations, together with relevant wills, eventually revealed that in about the year of naturalisation they all changed their surname to Grafton and Anglicised their given names to John, Ferdinand and Ernest Humbert. John Grafton lived out his life in England. In 1881 he was a boarder at 25 Emperor’s Gate, South Kensington, living on English funds, and again wrongly described himself as a widower. He seems not to have been in England when the 1891 census was taken – possibly because he had travelled to either South Africa or the United States to visit members of his immediate family or to the south of France to visit Edwin Prodgers and his family, with whom he seems to have been on very good terms. He died at Brighton on 10 May 1897 leaving his estate of just under £17,000 in the care of his executor, Edwin Prodgers. Caroline and Giovanni’s elder son, Ferdinand Grafton, apparently intended initially to join the army because in 1881 he was an ‘army student’ in lodgings with several others at Greenwich. He must have decided otherwise and instead went to Natal in South Africa, where he made a career for himself as an importer and breeder of livestock. He lived on a farm which he renamed Green End; this, as we shall see, was the name of the estate to which Edwin Prodgers moved from Ayot St Peter. Ferdinand married Elizabeth Shore in 1888, and in the following year they had a son Ferdinand Ernest Herbert Grafton (1889-1945). The marriage did not last; the couple were divorced in 1898 and then Ferdinand went to New England, where he was described as a broker. He married Rose Isabel Symes at Boston in April 1905 but again the marriage did not last; Ferdinand died aged 43 in January 1906. Rose was born in Dorset in 1863 and she returned to England shortly after her husband’s death. With her she took a six-year old daughter Enid Muriel Grafton, who had been born on 24 August 1900 at Scarborough. The circumstances are somewhat enigmatic, but it appears likely that Enid’s father was not Ferdinand and that she was given his name when her mother married. Rose went on to marry William Draper in 1908 and had a son Geoffrey Symes Draper in 1910. Rose Draper died in 1942 at the Hampshire home of her daughter Enid and her husband John Archibald Bevan (1888-1970). Ferdinand’s son, Ferdinand Ernest Herbert Grafton, married Christine McAlpine in Natal in 1912, and they had a daughter Christine in 1915. They were divorced and in 1921 Christine, her daughter and her father left Natal and travelled via London to Co. Tyrone in Northern Ireland. Ferdinand junior remarried in 1926; his second wife was Anna Barbara van Niekerk. This second marriage also seems to have failed because when he died in 1945 his widow’s name was recorded as Mary S Grafton. His burial was in the KwaZulu Natal Military Cemetery, Durban, because he had served with the South African army. Caroline and Giovanni’s younger son, Ernest Humbert Grafton, followed his father into a naval life, but in his case the Royal Navy. At the tender age of 12, on 15 January 1877 he enlisted as a cadet and eventually rose to be Captain of the Dockyard and King’s Harbour Master at Chatham with the rank of Rear-Admiral. Earlier, when his service took him to Dublin, he met and married Ethel Maud Wright at Dalkey. The wedding was in January 1901 and at the end of the following year a daughter, Winifred Emily Grafton, was born at Dalkey. The marriage failed and on 31 July 1910 the divorce was made final. Ernest never remarried but Ethel remarried in Scotland some three days after the decree absolute. Her second husband was Kenneth MacGregor Laird of the Argyll and Sutherland Highlanders (1880-1954). Kenneth Laird was born at Birkenhead; he was a son of the chairman of Laird, Son & Co. which, in a merger in 1903 with Johnson Cammell & Co. of Sheffield, became part of the famous shipbuilders Cammell Laird. 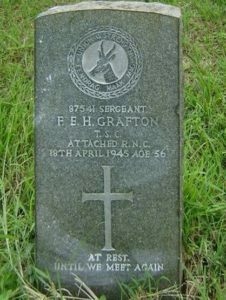 Ernest Grafton went to live in Switzerland following his retirement from the Royal Navy in 1916. He died in August 1924 as a result of an unsuccessful operation at a hospital at Lucerne. His daughter Winifred developed a disability and by 1939 she was living in an establishment at Edgware run by John Groom’s charity. She spent the rest of her life there. Caroline’s daughter, Eleanora, was born in 1872 and baptised with the surname Giacometti at Ayot St Peter on 9 February 1873 by Edwin junior’s successor as rector, Rev Henry Jephson. In 1881 she was living with her mother in St John’s Wood, where her surname is given in the census as Prodgers. During the 1880s shipping records show that she travelled with her mother very extensively around the world. In 1891 (after her mother’s death) she was a pupil at a school in Kilburn under the name Nora Hill. She used the name Hill for the rest of her life – presumably to escape her mother’s notoriety. She qualified as a midwife in London but by 1937 was living in south-west Cumberland (now Cumbria) working as a health visitor. Her home at 2 Rigg Cottages, Holmrook, was shared with Mary Cicely Fair (1874-1955), who was a remarkable woman and could aptly be described as a polymath; Mary remained at 2 Rigg Cottages until the end of her long life. Eleanora apparently inherited some of her mother’s mental instability because she died in July 1937 as a patient in a mental hospital near Carlisle. She was 64, unmarried and apparently intestate. Edwin, the elder son of Rev Edwin and Caroline Prodgers (née Blades), was born at Clarence Lodge in 1833 and baptised at St Matthew Brixton on 1 September. He went to Eton and then up to Oxford before being ordained into the Church of England and becoming his father’s curate and successor. In 1864 Rev Edwin Prodgers junior married Elizabeth Ellen Surtees (1844-1914) at All Saints Little Munden. The rector and his wife must have considered that Ayot Bury was too large for them, because shortly after their marriage Edwin had the new rectory built to Pearson’s design, after which point the church authorities were able to sell Ayot Bury into private hands. However, it was not long before Edwin abandoned the ministry and went to live at his wife’s family home, Green End House. This grade II listed property was built in 1825 by Jonathan Snell Chauncy, his branch of the Chauncy family having arrived in the parish of Little Munden a decade or so previously. 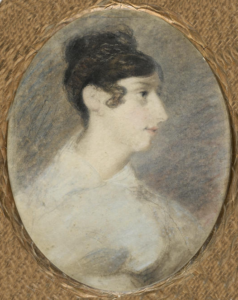 Elizabeth Prodgers was the daughter of Henry Edward Surtees (1819-95) and Eliza Snell Chauncy (1821-54). Like John Blades, Henry Surtees was from the far north of England. His parents were Robert Surtees (1782-1857) and Elizabeth Cookson (1783-1847) and the family home was Redworth Hall near Darlington in County Durham. Eliza’s parents were Charles Snell Chauncy (1789-1866) and Elizabeth Beale (b 1795). 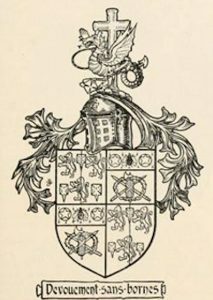 Charles’ father was Charles Snell (1759-1809) who, having married Amelia Chauncy (1758-1841), was given royal licence in 1783 to use the surname and arms of Chauncy in addition to his own. When the new church was built at Ayot St Peter in 1875 to replace the Pearson church built during the time when Edwin Prodgers junior was rector a brass plaque commemorating the fact that Rev Charles Chauncy (rector 1766-1804) and his mother Elizabeth (d 1767) are buried in a vault in the old churchyard was fixed to the north wall of the aisle. This must surely have been at the urging of Edwin and Elizabeth Prodgers in view of her Chauncy lineage. Edwin was succeeded as rector of Ayot St Peter in 1869 by Rev Lewis Newcomen Prance, but he was in office for only two years or so before Rev Henry Jephson took over. By the time of the 1871 census Edwin and Elizabeth were established at Green End. Their first daughter, Elizabeth Caroline, was born in 1867 at Green End even though Edwin was still rector of Ayot. The second daughter, Edwina Georgina Frances, was born in 1871 at Green End at or around the time of the family’s move there. By the time his new church was destroyed by fire in July 1874 Edwin had moved his family to the south of France. He wrote to Henry Jephson from Nice to commiserate and to offer some financial support for the building of the replacement church on the new site. Some inkling of the lifestyle at Nice can be gleaned from an account of a bet of 1,000 louis (a louis being a coin worth 20 francs) taken by Edwin in February 1874 that he could not get from his home at 19 Promenade des Anglais to the casino at Monte Carlo in one hour using only the means of transport available before the railway along the coast was built. He achieved the feat (mostly on horseback and partly on foot) with two and a half minutes to spare. The account notes that Edwin was a daily habitué of the casino. Elizabeth died at the family home in Nice in 1914 and Edwin died there four years later; they left English estates of £2,556 and £702 respectively. Both their daughters married. Elizabeth’s husband was Jean Roissard, baron de Bellet (a wine producer), while Edwina’s was Paul George Rene Japy de Beaucourt (an industrialist). Baroness de Bellet died in 1931 (leaving an English estate of £652) and Madame Japy in 1952. Herbert, the fourth child and younger son of Rev Edwin and Caroline Prodgers (née Blades), was born at Clarence Lodge in 1835. His baptism at St Matthew Brixton was conducted by his father on 3 August. Like his brother he went to Eton and Oxford but he aspired to be the epitome of the country squire and succeeded brilliantly. 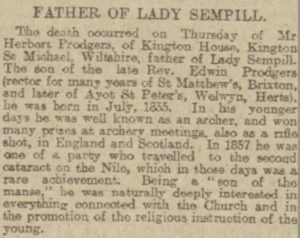 In 1860 he married Emily Sibella Phillpotts (1835-1918) in Cornwall. In December 1861 his father died and he no doubt came into a substantial inheritance. This encouraged him to buy the manor of Kington St Michael, near Chippenham in Wiltshire. In 1863 his mother died and more money would have come his way. In that year he demolished the old manor house and built a magnificent replacement. The Kington parish website has photographs of Herbert and his new house. He also had land in Scotland – presumably an estate suited to hunting, shooting and fishing. Herbert died in April 1917 and Emily almost exactly a year later. Herbert left an estate of £82,681 and Emily’s amounted to £2,381. There were seven children born at Kington between 1861 and 1876 – Cecil, Ronald, Harold, Charles, Gwendoline, Rhoda and Greville. Cecil Herbert Prodgers (1861-1924) married Emily Mary Schoener in 1907 at Southampton. They had a daughter Gladys Marie Prodgers in 1909. Late in life she married Alexander Ogilvie Cheape (1899-1981) at St Andrews, Fife. When Cecil died in 1924 he left an estate of £15,449. Ronald Edwin Prodgers (1863-1937) went to New Zealand, where he contracted two marriages and died at Auckland. He left no issue. His estate in England amounted to £279. Harold Augustus Prodgers was born in 1865 but died aged 14 in 1879. Charles Henry Prodgers (1867-1940) married Dorothy Lees (1876-1933) at Chester in 1903. Charles was ordained as a clergyman in the Church of England in 1898 and was a noted yachtsman. They had two daughters – Eva Dorothy (1905-90) and Marjory Dorothy (1911-99). Eva did not marry but Marjory married Thomas J Macaulay at Westminster in 1934. Charles had an estate of £3,968 when he died in 1940. The elder daughter, Gwendoline Emily Mary (1869-1944), married into the Scottish aristocracy in June 1892. Her husband was John Forbes Sempill (1863-1934). He was the 18th Baron Sempill. His estate totalled £30,411. They had a son William Francis Forbes Sempill (1893-1965) and a daughter Gwendoline Janet Forbes, who was born in 1897 but died aged 12 in 1910. William was the 19th Baron. He had a daughter Ann Moira Forbes Sempill (1920-95), who was the 20th Baroness in her own right. The youngest of the seven children, Greville John (1876-1952), went out to Africa but never married. He died at Nyeri in Kenya in 1952, leaving an estate in England amounting to £2,407. It is remarkable that a simple investigation of a tomb in the old churchyard could lead to the revelation of such an interesting history. The full genealogy of those involved is to be found in a public family tree on Ancestry.co.uk entitled “Prodgers tomb”. The first funeral of the young Emily Prodgers in 1850 was probably quite a small affair with only immediate family present. When the rector was buried in 1861 there would not have been very much space available in the old octagonal church. It is not known exactly how many it could accommodate but it was really quite a small building. Nevertheless the funeral will surely have been attended by most of his family and that of his widow, together with friends, neighbours and members of his congregation. 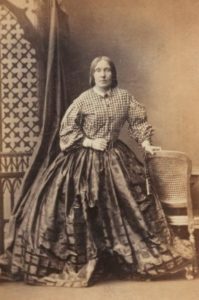 Caroline’s elder sister Elizabeth Blackburn had died in 1860 but her younger sister Laura would no doubt have wanted to be brought up from Streatham. When the Pearson church was dedicated in 1862 it attracted a large crowd, including numbers of those who would today be called the great and the good. Caroline Prodgers’ funeral in 1863 in the new church could well have had quite a large attendance, including again her sister Laura. Her daughter Caroline had married Giovanni Giacometti in 1862 and they presumably attended, together with their first infant son. There remains the question whether the tomb has ever been visited by relatives of those interred since 1863. The Giacomettis certainly came back to Ayot for the baptism of their second son in 1864. Whether, after the divorce, the Graftons as they became (father and sons) ever visited the tomb has to be doubtful. Caroline Giacometti Prodgers came back for the baptism of her daughter Eleanora in 1873 but again whether either of them ever returned to Ayot seems not very likely. Edwin Prodgers junior may have visited occasionally from Green End but after he took his family off to Nice in the early 1870s he surely never came back. His brother Herbert established himself in Wiltshire and must rarely, if ever, have paid a visit to his parents’ tomb after the last of the funerals. 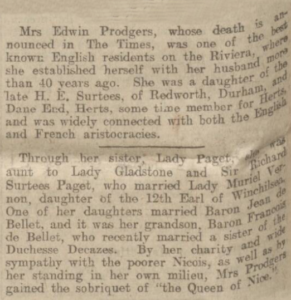 There must be a considerable number of people alive today with genealogical links to Edwin and Caroline Prodgers who would have a reason to visit the old churchyard and it is to be hoped that publication of this history and the family tree will encourage at least some of them to do so. They will be pleased to find the tomb and the churchyard in good order. We would love to hear from any descendants or family members – do get in touch using the “contact” tab.